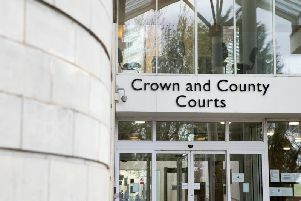 A man who intentionally drove his car at a police officer in a bid to escape has been sentenced to two-and-a-half years in prison. Andrew Brady, 25, of Duck Street, Rushden, pleaded guilty and was sentenced at Leicester Crown Court yesterday (Thursday). He was given a one year and 10 month sentence for causing actual bodily harm and one year and 10 months for dangerous driving, to be served concurrently. He was also sentenced to five months for driving while disqualified and a further two months for breach of a previous suspended sentence. As well as a jail term Brady was disqualified from driving for two years and 10 months. On Sunday, May 6, two officers identified a grey Peugeot 206 while waiting at traffic lights in Silver Street, Kettering. The vehicle, which had four people inside and was in a shabby state of repair, was uninsured. It began to gain speed before moving into Barnes Close, a small cul-de-sac where the officers positioned their patrol car to prevent the suspect vehicle from exiting the close. As they got out to talk to the occupants of the Peugeot, two men got out of the rear of the vehicle and made off over a fence into the estate. One of the officers, PC Cheatham, approached the driver’s window and spoke with Brady who was the driver, telling him to turn the engine off. But at this point he reversed at speed, while turning at the same time and causing the officer to take evasive action. Brady then drove toward the other officer, PC McKenna, who was in front of the vehicle and attempting to block the escape route, hitting his leg causing him to fall forwards onto the bonnet and then roll sideways with his leg caught by the front wheel. He then fell backwards hitting his head on the floor. The officer was taking to Kettering General Hospital where he was treated for a fractured wrist and lacerations to his head. Following an extensive search, the abandoned vehicle was located that evening in Stanley Boddington Court, Kettering. Police carried out extensive investigations and were able to identify Brady as the suspect who was later arrested and charged. Detective Sergeant Davine Cullen, who led the investigation, said: “It is fortunate that the actions Brady took, did not cause more severe injuries to PC McKenna. “The outcome could clearly have been far worse. “Dangerous actions taken against officers who are going about their lawful duty will not be tolerated and we will seek to bring charges against anyone who does so.